Iain Macdonald lives locally in the parish of Eaglesham and runs a 250 hectare sheep farm. He is married to Marion and they have three teenage daughters who all help out at busy lambing times and throughout the year on the family farm. 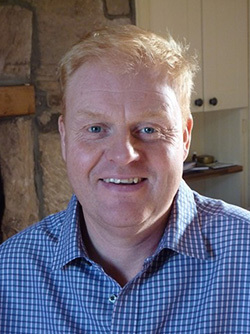 He is a director of East Kilbride Agricultural Show committee and helps with the organisation of this successful event. A recent development on the farm is the introduction of three wind turbines, a diversification project which Iain has been very involved with from planning through to installation in 2014. A keen golfer Iain enjoys travelling to many of Ayrshire’s golf courses with his clubs. He was a past member of East Renfrewshire Young Farmer’s Club and Eaglesham Round Table. As a current committee member of the Eaglesham Fair group he can be found helping out with the Santa Run, Christmas Tree lighting and of course the bi-annual Eaglesham Fair.